I was reading through a sweet little recipe book on making common snacks and grocery items from scratch when I found a recipe for potato chips. Now, why this has never occurred to me before, I have no idea, but it shot off in my brain as the perfect use for the mounds of potatoes in my home. So, the good news is that after last week, there is no longer a mound of potatoes in my home. The bad news is that although handmade potato chips taste WAY better and are WAY more cost effective than store-bought ones, the nutritional value is probably just about the same. So, probably not everyday food. But, you can reuse the oil for multiple fryings, which makes the purchase of peanut oil pay off, and if you’re wondering if the 2 gallon-size of peanut oil that Costco sells is worth it, it is. Absolutely. Heat the oil in a large kettle or pasta pot over medium-high to high heat (I put it on 8.5/10 on my electric stove). Fill a large bowl with cold water. Using a mandolin, a slicer on a box grater (the single blade), or a knife, slice the potatoes as thin as you can get them. Immediately place them in the cold water as you continue to slice the remaining potatoes (this will prevent them from turning brown and remove a little extra starch from the surface). Cover a baking sheet with paper towels. Once the potatoes have soaked for 10 minutes or so, drain them and spread them on the sheet to dry. Blot the extra water with a few extra towels to get the potatoes as dry as possible (this will prevent sputtering as they hit the oil). Prepare another baking sheet with fresh paper towels. When the oil reaches 375 to 400 degrees (test with the instant read thermometer), throw about 1 c. of sliced potatoes into the oil (I usually place them in with a spider skimmer, about arm’s length away, because I don’t want any more oil burns on my hands. Yes, I have a few). Fry, stirring with a metal spoon to make them curved and crinkled (which is beautiful), until the inside of the chips are a nice golden brown. Remove with a metal slotted spoon or spider skimmer and place on prepared sheet. Wait for the oil to return to 375, and continue to fry in batches. 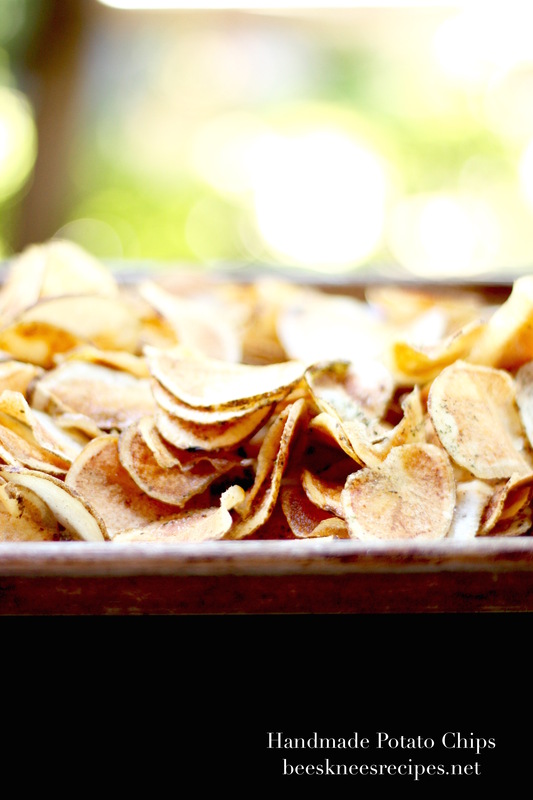 Season the hot potato chips with a shake of salt and pepper, a dusting of ranch or barbecue powder, or freshly cut rosemary, and eat immediately or save for an excursion to the woods. Enjoy.